San Diego beach weddings at beautiful oceanview wedding locations. Our Easy, Breezy Beach Weddings are a fun, stress-free option to the traditional wedding planning process. Vintage weddings, beach elopements, last minute and short notice wedding ceremonies are always welcome! 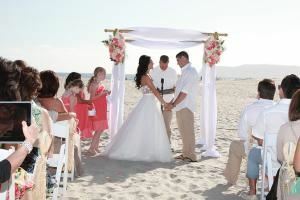 The ideal service for today’s busy couples, Seaside Wedding San Diego will save you the time, energy and hassle of researching beach wedding locations, photographers, officiants, chairs, arches, florists and more. You can relax and rest easy while we take the guess work out of the wedding planning. The only thing you need to worry about is exchanging your vows and enjoying your day. Just take a deep breath, relax... and dream!